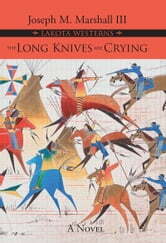 The second novel in Joseph M. Marshall III’s acclaimed Lakota Westerns series, The Long Knives Are Crying begins ten years later, in 1875, as Sitting Bull begins gathering thousands of Lakota to face the growing problem of white incursion. What follows is a sweeping tale of the Battle of the Little Bighorn (the Greasy Grass battle) and the remarkable defeat of General George Custer and the Seventh Cavalry, including the days and weeks leading up to the conflict and the lesser-known but strategically important Battle of the Rosebud. Told from the Native perspective through the eyes of the veteran warrior Cloud, Long Knives goes beyond the story of the battle to create an authentic vision of the Lakota way of life. Once again, Marshall imparts his unique voice and eye for detail, creating a page-turning Western with a style of its own.